Gourmet Popcorn: A New Snack Trend! The concept of gourmet popcorn is still niche with limited geographic penetration. However, with changing time, it is emerging as popular snacking item and finding newer distribution channels. The concept of gourmet popcorn is gaining momentum beyond the metro cities. As per the market study, the Indian gourmet popcorn market is expected to grow at a CAGR of 36% during the forecasted period of 2016-2022. However, this segment is still niche due to less geographical penetration, hence offers an immense opportunity especially for startup entrepreneurs to tap the potential in this growing market. In fact, the big companies are also gearing up, they are experimenting with new flavors and looking for lucrative partnerships to increase the penetration, for example, two years ago, PVR Ltd, the country’s largest cinema exhibition operator had acquired 70% stake in Zea Maize Pvt Ltd, which runs the Delhi-based popcorn chain 4700BC Popcorn. 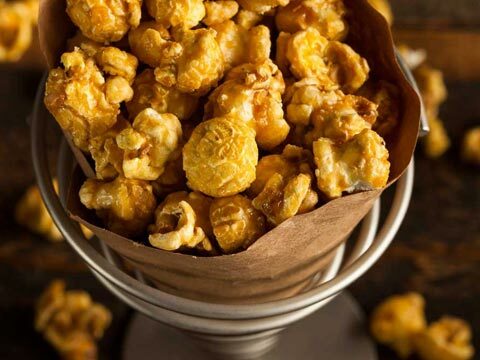 Since India is going through a shift where munching on healthier snack has become the hottest trend, gourmet popcorn as the category has a lot of potential to grow. Besides, key player such as 4700 BC Popcorn, The Crunch box, Wow Food Brands etc there are many new emerging players, let’s shed light on the journey of few.. Currently, the company is operating via kiosk model where the product is being manufactured at the company owned central factory and supplied to the kiosk. However, some varieties are also prepared at the Kiosk also. The company also retails ready- to- eat Nitrogen flushed packs with higher shelf life for distribution in the modern trade segment via local distributors. The company supplies to the many prominent cinema houses based in Eastern market along with Intuitional Sales in Bhubaneshwar. The company is looking to add more stores on franchise as well as company owned model. Chirag Gupta, Co-Founder & CEO, 4700 BC Popcorn is one of the early starters of gourmet popcorn business. Before 4700 BC, Gupta was consultant with Deloitte Consulting Services in the US. After completing about five years with the company there, in 2012, he decided to leave the US and come back to India to start something on his own. “Since, the beginning I knew that our product has some premium-ness attached to it; hence, our positioning has to be right. Also we keen on changing the flavors to keep the freshness intact and offer the ultimate gourmet experience to our patron. We have evolved the product is such manner that it can be accepted as gifting item as well,” Gupta added further. The company will soon start its distribution in tier II markets as well with a slightly tweaked pricing strategy. As of now, the company has 23 offline stores along with online presence. The company is looking to add another 10-12 stores by FY19. The company would be targeting premium locations such as high end shopping malls for upcoming stores. Also, the company also serves it range via all leading domestics’ airlines, cafes and hotel chains. India has a rich practice of selling popcorn on push carts in small towns and metro cities alike, so having developing organize retail distribution is really challenging. Sharing the entrepreneurial journey Neha Goyal from Wow Popcorn said, “When we started, people had never seen a popcorn store before and were not yet receptive to the idea of healthy popcorn served fresh as an over the-counter snack. However, the things have evolved since then.” As of now, the company has three outlets in Mumbai. Highlighting the similar views, Diksha M Rai, Co-founder, The Crunch Box said, “It is very challenging to create a market for gourmet popcorn especially when people are used to freshly prepared popcorn straight from kettle. Just like in the cinemas. Gourmet popcorn is a new concept. Gourmet popcorn promises unique flavours and a never before experience with munchies. Remember popcorn is all healthy as compared to chips and fries. The Crunch Box was launched in December 2014 at the Select Citywalk mall in Delhi. And since then the brand has been associated with the leading brands in the hospitality and catering industry. Indigo Airlines, Barista , Fortis, British School, Cinepolis, Lalit Hotel, Taj hotel , Cideda Goa just to name a few from the list. Presently, the brand is available in all leading malls of Delhi. As per Diksha, the concept of gourmet popcorns should do equally well in tier II cities if the product is genuine and competitively priced. There is always an audience for quality product. The company is shortly going to open its first outlet outside Delhi at The Elante mall, Chandigarh. Clearly, the concept of gourmet popcorn can be a lucrative venture if positioned and promoted rightly.